I was shocked, and then saddened, and then, very worried for them. 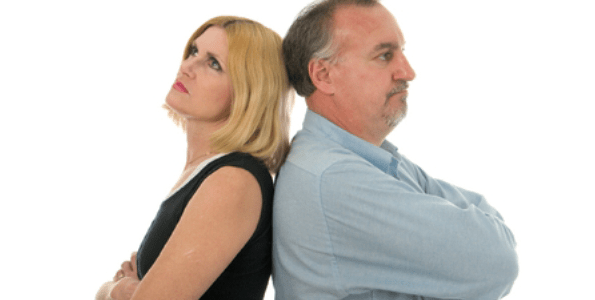 How long can a marriage last when there is no communication? Would we ever get together with them as couples again? In a marriage or in any other kind of relationship, what do you think is the most effective way to show contempt for the other person? Words spoken in anger can be very bad, and much regretted later, but that is not the worst one can do. Sarcasm will not get you very far, but that also is not the worst. Making fun of another person is also not very nice, but one can do worse even than that. One of the worst ways one can treat another person, or we might say, the best way to show contempt, is to ignore them, to treat them as if they are not even there; to not hear what they say, to not respond, and to not speak to them at all. This is, in effect, to treat them as if they were dead– and it can’t get much worse than that. In its milder forms, this has been called the ‘silent treatment,’ and we’ve all maybe done that a time or two– briefly. And, it can even be a good idea to remain silent for a while when everyone needs to cool down a bit. But when that goes on for six weeks, it is a sign of big trouble. The Bible doesn’t say ‘don’t ever get mad,’ but it does say, ‘don’t let the sun go down on your anger.’ A relationship will die if there is no communication, whether that is due to anger, or perhaps just lack of interest. That also goes for our relationship with God. God has chosen to create us, and, to communicate with us. God has given us the opportunity to communicate with him, and He has invited us to do so anytime. We should not neglect so great a privilege. We should not ignore God. We should not, by our silence or by our refusal to listen or respond, show contempt for God. But how does one talk to God? Has anyone here ever see God? Probably not. Has anyone here ever said anything to God? Probably so. We’ve all prayed. But has anyone here ever heard God talk back in an audible voice? Probably not. God does not very often speak to anyone that way. He has spoken like that, says the Bible. But even the Bible says He doesn’t do that very often. So what do we do? Every Sunday we gather here for worship at 8:00, 9:15, and 10:45. The service is all planned out ahead of time and printed in the bulletin for you to follow. It is not very much like a casual conversation where you just sit down and start talking about whatever comes up. But actually, worship is like a conversation. It is one of the most important ways that we communicate with God. Worship is in fact, at its most basic level, a conversation with God. During this hour God speaks to us in a variety of ways, and we respond to God in a variety of ways. This communication is not exactly the same as our conversations with each other after the service; but it is communication. God has spoken directly to a few people over the years. He has even appeared to a few in various forms. And, God was here on this earth, in person, as Jesus Christ for 33 years. God has, in these ways, spoken to this world in visible and audible ways. We may not have seen or heard him ourselves, but we have, in our Bibles, an account of what he had to say. The Bible is the primary way that God communicates with us now. It is God’s Word to us. Some folks read it every day, and some folks don’t read it at all. But when we worship together, our service is filled with God’s Word. Our order of service in the bulletin (our Lutheran liturgy) makes sure that when you come to church you will hear God’s Word. As a preacher, I take comfort in that, because there are weeks that I can’t come up with anything for the sermon I am very satisfied with. Still, it is my job to get up here in the pulpit every Sunday morning and start in. And I know very well that not every sermon speaks to every person every Sunday. But the value of this worship hour doesn’t all depend on me and my sermon. The service itself is filled with God’s Word to you. At the very beginning, after we confess our sins, I announce to you God’s word of forgiveness, as Jesus Christ himself in John 20 authorized me to do. In the greeting we receive a Biblical blessing from II Corinthians; and in the closing benediction, we receive the words of blessing from the Old Testament book of Numbers. In the Scripture readings we hear three or four sections of the Bible read to us, or, as in the Psalm, read responsively by all of us. And in the sermon I try to bring a message based on God’s Word and applied to our lives today. We hear God speak to us in the worship service each week.